Most of us have never heard of the Mandans, and yet the Mandan villages of the upper Missouri were a bustling, prosperous, hub of trade and commerce by the middle of the 18th century. Food, trade, and culture; Native American and European visitors, all passed through their densely settled towns. Commercial ties stretched from New Mexico to Hudson Bay. Lewis and Clark wintered with the Mandans in 1804 on their way west and a Mandan chief, Sheheke, accompanied them back to Washington in 1806. Encounters at the Heart of the World revises what we think we know about early American history by shifting our attention from the English-speaking east coast and revising our understanding of the Native American past. Venturing into the period before Lewis and Clark, it offers us a vision of a people that will enrich the way we think about ourselves and our history. Fenn’s mosaic brilliantly overcomes the shortcomings of her written and archaeological sources . . . Readers who follow her toward, but never quite into, the heart of the Mandans’ world will be richer for the journey. 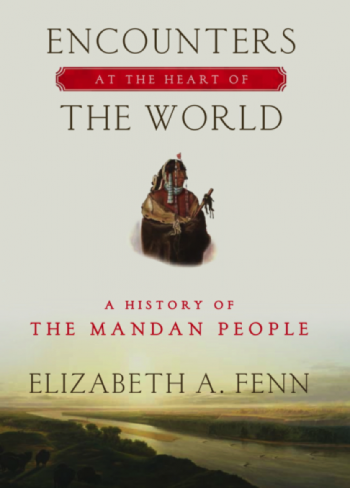 The Mandan story is a reminder that even the most flourishing societies can be brought low, in virtually an instant, by the unpredictable workings of the natural world (to say nothing of human foes). But Fenn’s account tells us also that cultures can persist and even recover in the wake of such awful devastation. In this innovative and illuminating book, Elizabeth Fenn reorients early American history toward the geographic center of the continent. There, long before the arrival of colonists on the Atlantic coast, the Mandan people built one of the most important and enduring trading centers in America. Using tools from archaeology, anthropology, and epidemiology, Fenn reconstructs their remarkable story and recounts it in absorbing and transparent prose.